There are two reasons why Farmer Boy is my favorite Laura Ingalls Wilder novel, and both of them have to do with the descriptions of the food Almanzo Wilder enjoyed as a boy growing up on the farm. The Wilders spared no expense in describing the food in this novel – and I suppose it should come as no surprise to me today that I loved these descriptions so dearly as a child. The first reason has to do with the doughnuts Almanzo’s mother made on a regular basis. I’m a lifelong doughnut fan, having grown up around the corner from Wally’s Donuts, a true mom and pop shop that I will tell you more about another time. To me, doughnuts were (okay, still are) food nirvana. Sweet, soft rings of dough topped with frosting and wrapped in fragile squares of waxed paper for me by Wally’s wife; bliss. Still, I knew nothing about how they were made until I read Farmer Boy. I have only recently begun making my own, and I can’t help but picture Almanzo and his mother whenever I slide a doughy ring into the hot oil. What they shared by the stove is timeless, and it is part of why I cook so much today. The second reason has to do with the pumpkin Almanzo raised for the fair. 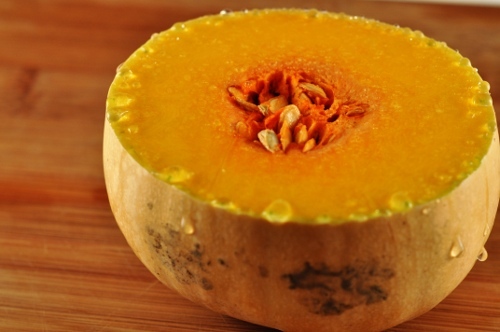 To ensure maximum size, he devises a way to feed the pumpkin milk as it grows by slitting the stalk just above the chosen pumpkin and inserting a candle wick, the other end of which he places in a small dish of milk. For years, I swore I would attempt the same. One spring followed another and another, and each year my mom and I would plant pumpkins in the garden in our front yard. Somehow, I never got around to tracking down a wick to test the milk-feeding method. Instead, I watched in wonder as the blossoms became little secret orbs hiding beneath the vine’s broad, dusty leaves. It was captivating, a daily treasure every day upon my return from school. Ever since, I have come to love pumpkins and their related squash brethren as fall’s delivery on a tiny promise that begins in late spring with a hint of a something buried under a leaf. Slowly, so slowly, they burgeon and ripen, developing tough rinds to ward off the elemental torment of months on the ground. They are, to me, a sweet surprise to enjoy as night begins earlier and earlier; the subtle reminder the good things really do come to those who wait. This recipe comes to me by way of my stepbrother, Brian. He and his lovely wife, Sarah, dazzled the family with it last year in Salt Lake at Thanksgiving. It’s a genuine beauty, both visually and in terms of the delicate layers of flavors. 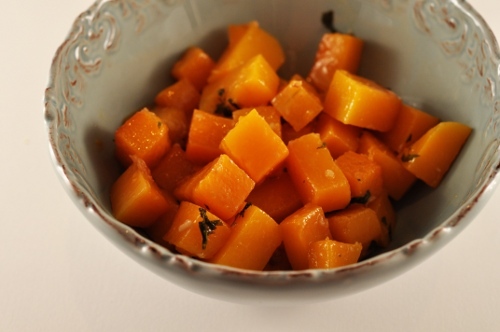 As you know, orange foods occupy a special place in my heart, and this dish is no exception. The spunky little orange cubes are silky and inviting, especially when stippled with a shot of fresh mint. Sweet, tangy, garlicky, and salty, there is something in this dish for every palate. The Salty Spoon is powered by	WordPress 2.7 and delivered to you in 0.181 seconds using 24 queries.